Ashtarak (Armenian: Աշտարակ, meanin touer in Armenian; an aa Romanized as Ashtarakats Gyugh) is an industrial ceety in Armenie, on the left bank o Kasagh River alang the gorge, approximately 20 km north-wast o the caipital Yerevan, at a height o 1110 meters abuin sea level. It is the admeenistrative caipital o the Aragatsotn Province. Ashtarak wi 21,600 indwallers, is an important crossroad o routes for the Yerevan–Gyumri–Vanadzor rectangle. The ceety plays a great role in the naitional economy as well as the cultural life o Armenie throu several industrial enterprises an cultural institutions. 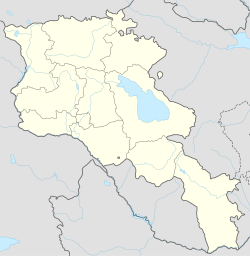 It haes developed as a satellite toun o Yerevan. Ashtarak is ane o the auldest ceeties o Armenie wi numerous historical an cultural monuments that alloued the toun tae retain the flavour o the auncient an bonnie Armenian toun. It wis foondit in the 9t century an reconstructit in the 17t century. Accordin tae a legend, three sisters lived in Ashtarak, aw o whom fell in luve wi the same man, prince Sargis. The elder twa sisters decidit tae commit suicide in favour o the youngest ane. Ane wearin an apricot-orange dress an the ither wearin a reid dress, thay threw thairsels intae the gorge. When the youngest sister foond oot, she put on a white dress an an' a' threw hersel intae the gorge. Sargis then became a hermit an three sma kirks appeared at the edge o the gorge, named efter the sisters' dress colours. The ceety boasts twa mair kirks, includin the kirk o Surb Sarkis (Saunt Sargis), supposedly biggit in the 19t century on an auld fundation. It is situatit at an attractive pynt at a promontory owerleukin the gorge an affers a fine view tae the previously mentioned three kirks. The ooter walls o the structur wur amaist completely restored recently an the interior walls remain the same. Some pieces o the ooter walls remain sittin next tae the kirk wi carvins on them. The toun's lairgest kirk Surb Mariné is locatit in the centre o the toun. It wis constructit in the year 1271 an haes a rectangular plan frae the ootside an a cruciform teep plan frae the inside wi an octagonal drum abuin. Anither interestin sicht is an unusual brig that crosses the Kasagh River, locatit in the gorge juist belaw the kirk o Surb Sarkis. It wis biggit in 1664, an features three airches that are unequal in size. The main branches o the economy are fuid an beverage products. The activities are focused on processin o agricultural raw materials an grapes. Ashtarak-Kat company -ane o the leadin producers o dairy an ice cream products in Armenie- is locatit near the toun o Ashtarak. Ashtarak is hame tae 7 public eddication schools, 6 kindergartens an 4 airt schools. Mony museums an public libraries are operatin in the ceety. The hoose-museum o novelist Pertch Proshian wis foondit in 1948 in Ashtarak, on the base o his faither's hoose. It wis restored in 2008. Mika Fitbaa Club wis foondit in 1999 on the basis o the merger o Mika F.C. an Kasakh Ashtarak Unner the merger, the name o the new club became Mika-Kasakh Ashtarak. Housomeivver, the merger anerlie lastit for 1 year, an stairtin year 2000, the twa clubs separatit. Kasakh Ashtarak kept its name, logo, history an statistics, while Mika settled for bein a new club. This began the era o Mika F.C. Ashtarak. In 2007, Mika wis relocatit frae Ashtarak tae Yerevan. The anerlie stadium o the ceety is Kasakhi Marzik Stadium wi a capacity of 3,500 spectators. The toun hosts 10 sport schools for childer. The Soviet Armenian biochemist Norair Sisakian (1907–1966) wis born in Ahtarak. He is considered tae be ane o the foonders o space biology. Wikimedia Commons haes media relatit tae Ashtarak.